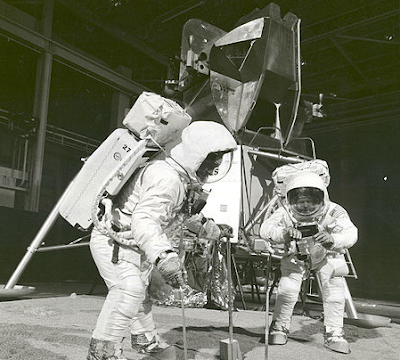 The Museum of SuperNatural History™: “Man (Maybe) Walks On Moon” - One Giant Hoax By Man, Or One Massive Conspiracy By Mankind? “Man (Maybe) Walks On Moon” - One Giant Hoax By Man, Or One Massive Conspiracy By Mankind? July 20th, 1969 marks the 40th anniversary of NASA’s successful attempt at putting a man on the moon. Or, some would claim, it marks the 40th anniversary of NASA’s successful attempt at faking putting a man on the moon. Interestingly enough, Kaysing was no run-of-the-mill crackpot, he worked for Rocketdyne (a division of North American Aviation, and later of Rockwell International) where the Saturn V rocket engines were built. Additionally, Warner Bros.’ 1978 thriller Capricorn One - about a faked mission to Mars, is also cited as a major catalyst for increasing global suspicion about the veracity of NASA’s lunar accomplishments, and to this day, the “fact” that the US faked landing a man on the moon is taught in Cuban schools. And as recently as 2001, Fox TV aired a “fair and balanced” piece of broadcast journalism titled: “Conspiracy Theory: Did We Land On The Moon?” that investigated the possibility that the Apollo mission was indeed a hoax.